Covering 84,000 square meters, 1520 exhibitors from 39 countries presented a range of innovative products during EuroBlech 2012, October 23-27 in Hannover, Germany. More than 60,000 visitors attended the show, 40 percent of whom indicated they were there with the definite intention of buying. When walking the overwhelming show, one finds new metalforming technology and solutions at every turn. Here’s just a sampling of what we found; we’ll provide more highlights from this biennial event in future issues of MetalForming, as well as in the winter edition of Fabricating Product News. Automated Notching Cell Produces Three Rotors and Three Stators from One Blank, in 1 min. The Nidec Minster Corp. unveiled its FlexNotcher system in full operation at EuroBlech. The customizable, integrated system features a Minster notching press coupled with robotic automation equipment. At EuroBlech, Minster’s technicians introduced our staff to a FlexNotcher sporting a 25-metric-ton notching press and articulated robot, able to produce three rotors and three stators from the same parent 870-mm blank, in 1 min. The press was operating at 1100 strokes/min. ; peak speed is 1200 strokes/min. 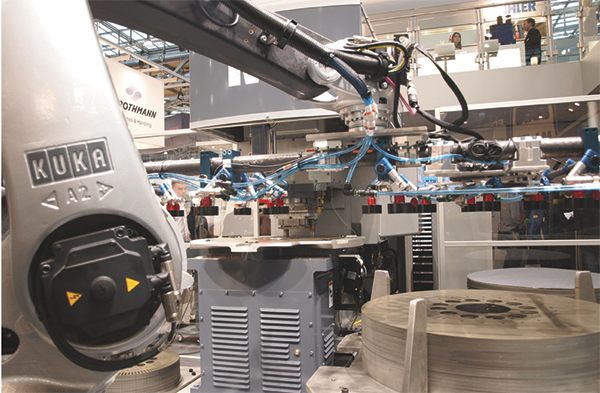 The FlexNotcher at EuroBlech also featured a patent-pending indexing system integrated in the tooling via a laser eye. Regardless of orientation on the staging stack, blanks are picked and oriented by the tooling so that the key position matches the driver key of the notcher indexer. This eliminates spacious external indexing stations, reducing floor space and cycle time. The robot’s magnetic and pneumatic end-of-arm tooling is designed to have blank picking and stacking hardware on one end, with finished rotor/stator picking and stacking hardware on the other. A precision centerline-adjustment mechanism allows for the production of stators and rotors in the same part setup. The direct-drive servo indexer rotates the blank 360 deg. to notch the rotor, then the centerline-adjustment mechanism repositions the frame to match the stator notches and, in a second cycle of 360 deg., the stator is notched and separated from the rotor. 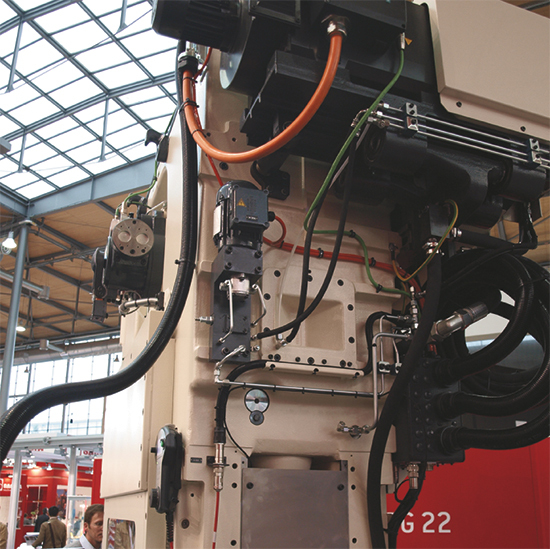 Placed on the world’s metalforming stage at EuroBlech by Bruderer was the BPG 22 planetary gearbox that, when installed on its BSTA 510 stamping press, turns the production high-speed press into a tryout machine at the flick of a switch. A planetary gearbox built into the shaft of the main motor of a fully automated stamping press enables test runs to be carried out, under manual control, at a low stroke rate and at full press capacity. The values that are produced can then be carried over exactly and used during a regular production process. The three-level 22-kW planetary gearbox has a ratio of approximately 1:19. And, so we were told by Bruderer engineers, the real heart of the BPG 22 is the software and the ability to manually control ram height and stroke rate. The machine operator can jog the ram slowly forwards or backwards in fixed geometrical increments, or by regulated shifting using preset values. Energy-efficient technology and intelligent use of raw material took center stage at the Salvagnini booth, under the logo KinEtic that appeared on much of the equipment on display. For example, the firm’s new B3 KinEtic press brake features unique drive technology that unites the advantages of electric and hydraulic press brakes, as well as the debut of its new kinetic-energy recycling system (KERS). The press brake—100-, 135-, 220- and 320-ton models—features hydraulic drives, but no tank, servo- or proportional valves or traditional pumps. The hydraulic oil works as a “liquid gear rack,” say company officials, which moves up and down by a pump with a speed-controlled brushless servomotor. For quick movements and for bending thin sheetmetal, the B3 KinEtic consumes a minimum amount of energy and power, yet operates at high speed. And, as with electric press brakes, the machine only consumes energy when force is needed. A further reduction in energy consumption occurs thanks to KERS, which recuperates energy during the down movement of the blade and reuses it for the following upward movement. Salvagnini also introduced its L5 KinEtic 4-kW fiber-laser cutting machine, which integrates the control cabinet and the beam source into the structure of the machine to create a compact and easy-to-install system. Fabricators can use the L5 to cut sheetmetal from 3 to 20 mm thick. Here, the KinEtic logo points to the firm’s energy-conserving patented compass kinematics, as well as a mass-efficient machine that uses carbon-fiber components. 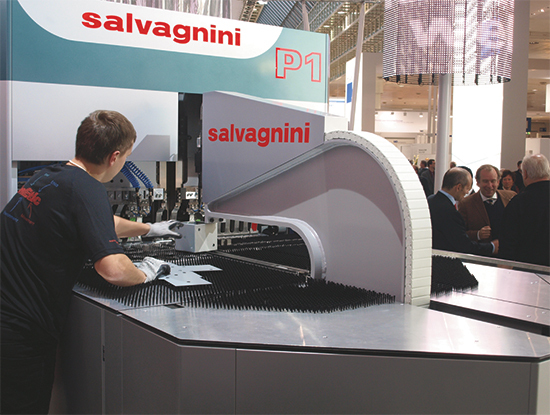 Lastly, Salvagnini showcased its new and improved P1 panel bender (shown)—completely simulated and optimized by using only state-of-the-art drives, motors and sensors. Data is transferred by Ethercat, dramatically reducing the number of cables and optimizing maintenance-friendliness. And, thanks to unique, patented kinematics of the bending frame, the P1 can reportedly produce bends that were not possible on previous models of panel benders. Spied by our staff at EuroBlech, and again at FABTECH, was LVD Strippit’s new ToolCell—a hydraulic press brake with an integrated tool changer. The machine’s automated tool-changing system reduces press-brake setup time, maximizing throughput and efficiency for small- to medium-batch production. ToolCell also reduces labor cost, say company officials, by eliminating the need for skilled labor experienced in tool-setup procedures. ToolCell stores a library of top and bottom press-brake tooling within a “tooling stadium” located under the machine’s backgauge. An innovative gripper design built into the machine’s backgauge finger allows the backgauge to serve as the tool-changer mechanism. As the press-brake operator prepares for the next job, selecting the workpiece or moving blank parts to the machine, the press brake automatically changes the top and bottom tooling as required. Software stores tool location within the storage racks, and also directs tool placement within the press brake. ToolCell is initially available with a 150-ton by 10-ft. press brake; stay tuned for 190- or 240-ton models with bend length of 10 or 13 ft. I had to climb up onto a platform to look down onto Amada’s new Lasbend AJ machine to really understand all that was going on inside. The machine, with 18 axes under control, is designed for quick production of prototypes as well as for the manufacture of individual parts and small runs within a self-contained production process. It combines a vertically oriented 2-kW fiber laser, a 10-axis rotary-bending unit and onboard four-station tapping setup, along with material-handling robots. During operation, the fiber laser first cuts subpanels (as large as 1250 by 2500 mm, from material to 4 mm thick) that are guided vertically through the machine for subsequent processing. The unique bending unit (200-kN capacity, 400-mm maximum bending length) with automatic tool changer boasts the newly developed BI-J angle-measurement system that measures the bending angle in real time and adjusts bending parameters as needed to ensure accuracy. 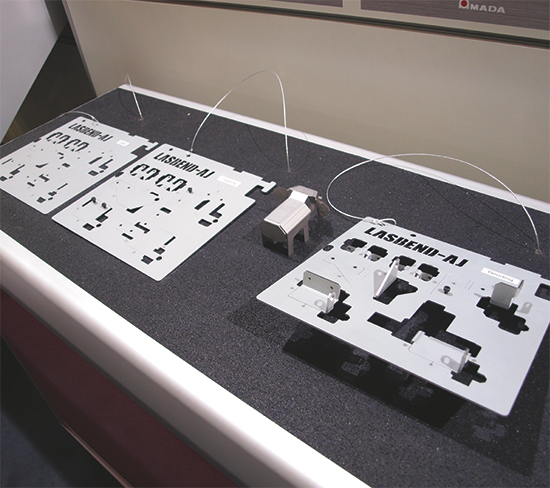 Shown are sample panels produced on the machine. 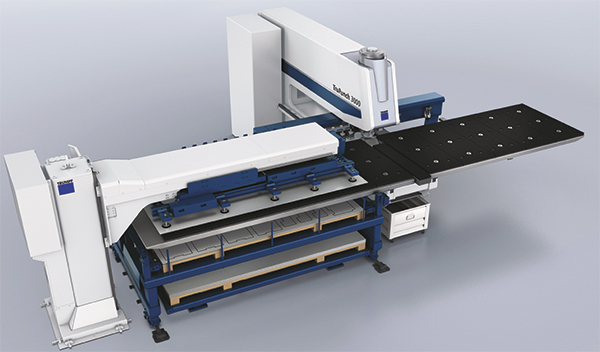 Trumpf raised eyebrows among showgoers with its new TruLaser Series 5000 machine, equipped with an 8-kW CO2 laser resonator and rated for cutting stainless-steel sheet and plate to 50 mm thick, as well as for thick aluminum work. The machine’s mirror-based optical system avoids the heat-related effects that can occur with lens-based systems, we’re told, minimizing the amount of cleaning required and decreasing wear rate. Also unveiled to EuroBlech visitors was the SheetMaster Compact (shown), for use with Trumpf’s TruPunch 3000 punching machine. The new automated-material handling system locates the automation components next to the machine, as well as placing some components below the machine’s worktable, noticeably minimizing the footprint of the entire system. And, the system reliably discharges microjoint panels or scrap skeletons onto a removal carriage, for untended operation. Taking center stage at the Mazak booth was a new 2.5-kW version of the firm’s 3D Fabri Gear 220 Mk II (shown), a fully automated multiaxis laser-cutting machine designed for machining of long components, including pipe to 8 m. The machine also features a built-in tapping unit and automatic loading and unloading. 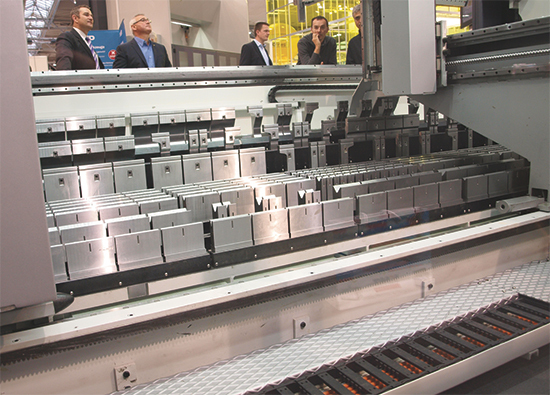 The machine was joined onstage by a new Optiplex 3015, a three-axis laser-cutting machine rated to a rapid-traverse rate of 120 m/min. Outfitted with a 2.5-kW CO2 resonator, the machine performs high-speed cutting of thick mild-carbon steel, stainless steel and aluminum work. It’s also offered as an optional fiber-laser model (2 kW) for high-speed cutting of thin sheetmetal. Front and center at the Schuler booth at Euro-Blech was a display touting the firm’s new TwinServo press, boasting a new drive concept with two decentralized servo motors in the press bed. The design, we were told, enables a more compact press, and, since the drives are located in the foundation, greatly reduces noise compared to standard servo-press models. It also improves accessibility and rigidity. In late September 2012, Schuler presented the prototype of a TwinServo press, with a force of 1600 metric tons, at its facility in Erfurt, Germany. With a height of 6 m, the new transfer press is much shorter than previous models. Plus, its footprint is smaller and the moving bolsters can be placed closer to the machine to ease die changes. The innovative design of the TwinServo press, without uprights, also improves access to the die area. Slide movement is handled by four draw rods that apply press force to the end faces of the slide. Compared to conventional designs, this allows greater eccentric loads, say Schuler officials. In addition, the maximum press force can be used right up to the bed edge for forming operations. The two press drives are arranged in the bed so that the draw cushion and scrap chutes can be located almost anywhere near the die-clamping area. 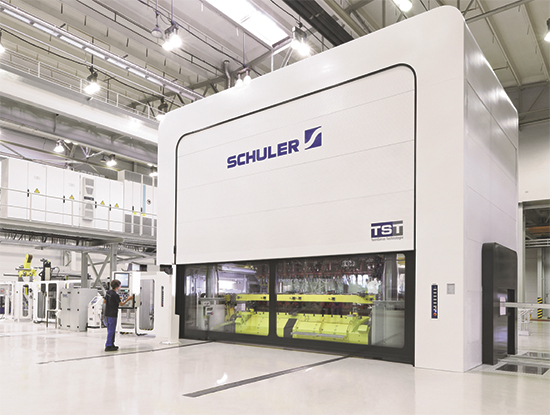 Schuler initially will offer TwinServo technology for transfer- and progressive-die presses rated from 1000 to 3500 metric tons, with a bed length of 5000 to 8000 mm. and bed width of 2200 to 3000 mm.